What could be achieved when your leaders are connected to their potential? Do you want to improve your employee engagement scores with a targeted approach to developing performance? Does your organisation have lots of information about the culture but no pathway for change or transformation? This program helps leaders develop leaders. When leaders effectively develop their direct reports, the brakes are released on leadership performance, potential is achieved, and leaders can make the difference they were meant to make. Essentially it’s about growing people to grow the organisation, and reducing the costs associated with unintended performance blockages. Bottom line – this is about the survival and growth of your organisation. Build the skills they need to have meaningful performance development conversations that support their leaders translate development insights into action. Know how to model a new approach to performance development that will deliver profitability and growth for your organisation. Are you ready to take the guess work out of leading leaders? 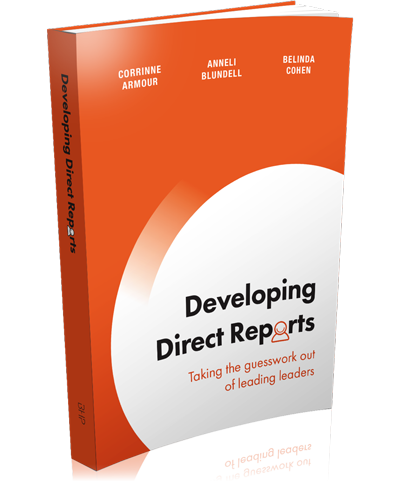 Developed by Corrinne Armour, Anneli Blundell and Belinda Cohen, this program is based on the book ‘Developing Direct Reports: Taking the guesswork out of leading leaders’.